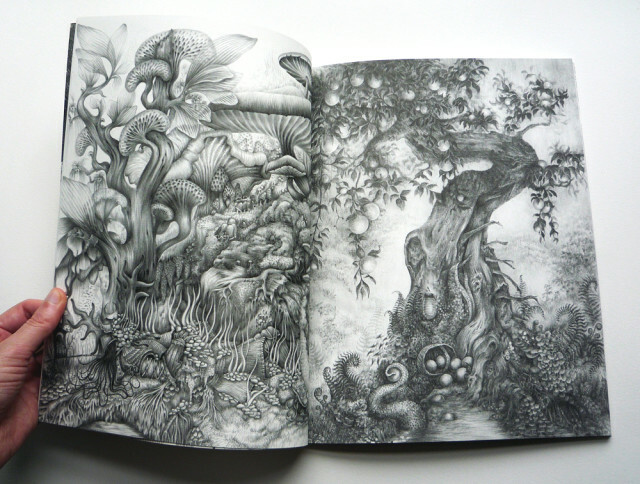 Dedicated entirely to art rendered in graphite Tiny Pencil Magazine Issue #1 was released in the UK just over a month ago. The introductory outing lets over two dozen artists loose to envision the theme “The Forest or Into the Woods We Go.” It’s a motif that got me singing “Teddy Bear’s Picnic” in my head and opening the pages of TP immediately paid off with “a big surprise.” All manner of woodland flora and fauna are illustrated in styles from hyper-realistic to phantasmagoria. The range of works evoke Doré to Disney and would win the approval Audubon or Tolkien. Cover artist Nick Sheehy’s outsized skulls and Vanessa Foley’s yin-yang ravens are my particular favorites at the moment but the magazine offers plenty of reasons for return viewing, discovery, and new faves. While there are a handful of interesting panel strip contributions that include text, the experience is for the most part strictly visual. Unlike many artzines, there are no interviews, evaluations or pontifications between the covers – and no adverts. Aside from tiny artist bios at the back, and an eclectic series of quotations – from Vincent Van Gogh to Dave Mustaine – that bound the rear cover, co-editors/contributing artists Amber Hsu and Katriona Chapman let the images speak for themselves. Alternately, if you want to know the inside story behind the mag’s inception and goals, Amber and Katriona gave this in-depth interview to Zainab Akhtar of Comics Beat. One of the hardest things to do is accurately transfer the subtleties of an original graphite work to the printed page. To their credit the Tiny Empire Press folks get it right across the boards. The delicate details and bold blocking of the disparate artistic techniques are exceptionally well represented. The matte finish paper is a perfect choice and has a wonderful feel and the print smells good too. What, you don’t sniff your books? Tiny Pencil is an addictive visual experience which has already inspired me to drop my trusty Rapidograph and pick up a neatly sharpened No. 2 for the first time in ages. The anthology magazine will be published bi-annually in hand-stamped numbered edition (I received #0536.) Each issue will celebrate a different theme. The editors also intend to produce some one-offs and have announced an “all-ages summer zine” focusing on “Mammals, Monsters and Mars” in the works. 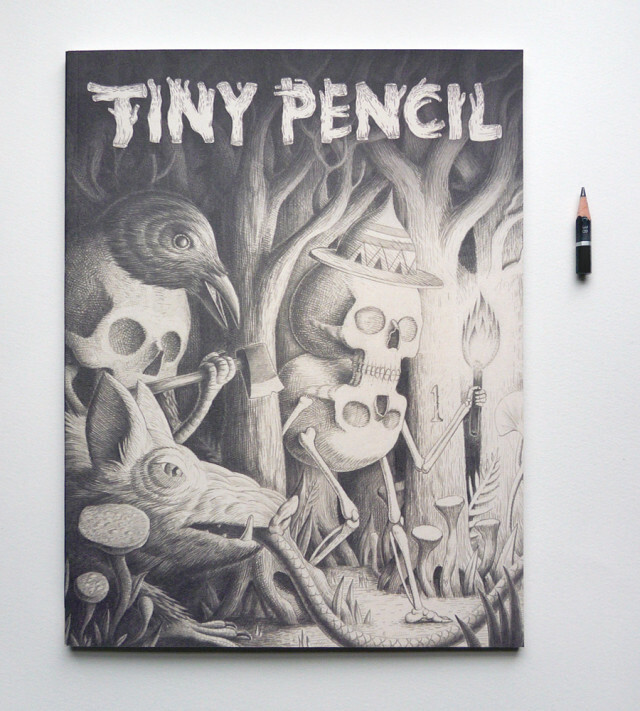 Tiny Pencil can be direct ordered from the magazine’s website. I purchased mine in USA via Forbidden Planet’s mail order. Artists interested in submitting work should click here for guidelines. Thanks to David Haden’s H.P. Lovecraft Blog, Tentaclii, for the heads-up on this one.